GREAT PROGRAM! While we talked about the book there was great talk about the Old Testament and the New, how they are so connected with the real America Spirit. YOU WILL WANT TO SAHRE THIS PROGRAM WITH OTHERS! Had enough of the liberal Left? It's time to take a stand, speak out, Push Back America! Millions of Americans are alarmed over our current cultural and political climate but afraid to speak out. They feel bullied into accepting a cultural and political outlook sharply different from what they believe. Demagogues on the Left aggressively push their ideology, making untold numbers of Americans question the historic promise and direction of their country. We need to push back against this tide of liberalism as we head toward a national election! 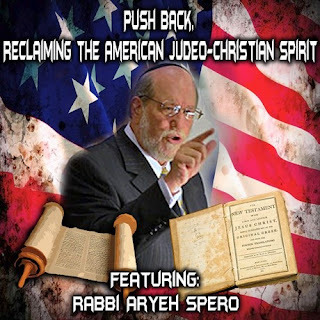 In the new book, Push Back, Reclaiming the American Judeo-Christian Spirit, Rabbi Aryeh Spero challenges the Left's subversive hijacking of terms such as compassion, tolerance, love, fairness, and social justice, which they distort to usher in socialism and empower a liberal ruling clique to the detriment of America's middle class. In heartfelt fashion, Spero confronts his ministry colleagues who promote what he calls "religious correctness," exposing the misuse of Scripture on behalf of leftwing political correctness. Rabbi Spero urges us to stand up and proudly proclaim the beliefs that have made America strong, free, and prosperous.